Looked at Truffault again in the week before his anniversary date which was marked by a Google Doodle. With a bit of luck this should mean a lot of people looking to see who he was. And watching some of his films. Could check DVD sales. Watched 400 Cent Coups from my collection and then decided to buy a DVD of La Nuit Américaine (Day for Night, 1973). In reading about the film over the years and forever coming across the first shot of the square where Alphonse, played by the adult Jean-Pierre Léaud, pops out of the metro, and then the exposure of the film-within-a-film with light, camera crane, it always felt this would be my kind of film. Having watched it twice – the no-English subtitle DVD, allowing me to focus more on the visuals; then in YouTube with English subtitles – I felt disappointed he chose to counterpoise his clever, funny film about film-making with a run-of-the mill film-within-a-film. Yes, it’s part of the fun to have a bog-standard melodrama – which Truffault himself said still demonstrates how film-making works – but there are reasons why a film-within-film as good as the film itself might have worked too. A sensible remark elsewhere: look at them as two films spliced together as well as a one film framing another. That is the physical reality, despite the viewer seeing the making of Pamela ‘through the frame’ of Day for Night. It’s easy to see why he chose a rubbish film to film, right down to questions of mise-en-scene. What’s so clever about Day for Night is how he teases out these issues at different levels: from that of Day for Night itself and how it shows how a film can portray filmmaking; from the point of view of the director of Pamela (played by Truffault himself), who narrates his opinions about films and film-making at certain points (yet the director of Day for Night, Truffaut doesn’t! ); and the interplay between the two films as exemplified by where Truffaut is allowed to be (can be) both directors at the same time, directing his own film with a crew we don’t see, and Pamela as Ferrand – at times Ferrand can be Truffaut directing Day for Night when he is in front of the camera directing as Ferrand. This is first shown at the end of the Square shot when after seeing the actors and crew break up from the mise en scene, moving in to listen to the assistant director talking through a megaphone, we see Truffault in the background showing the principle actors how to do their last action: a slap from character Alphonse to Alexandre. One’s first reaction is that this is Pamela‘s director, Ferrand, but it can just as easily be Truffaut the director of Day for Night showing how he wants the slap acted by the real-life actors. If Truffaut had gone for something which was almost equivalent in quality to his own film, it’d take away from Truffaut’s depiction (Eh? How? Since they’re both his films! ): primarily, at times we might have been more engaged in the story he was framing to the detriment of his own. A good story is a good story even if it’s a brief scene or two. Every time we were that absorbed in a narrative, we would be less aware there was another real director and his crew behind that. (Well, perhaps no! They alternate, so we are always made aware of which is which.) In practice the framed film takes only a 1/4 or so of the film’s total time. There is a point in Day for Night where this actually happens: the past-it woman actress can’t remember her lines because she’s drunk too much, and keeps on drinking more to try to remedy the situation, blaming other people for her ineptitude, while the director of Pamela – played by Truffault to make sure we never forget it’s a Truffaut film by appearing regularly as the acted director reassuring her with lot’s of, “It’s not a problem”, eventually taping her lines to various parts of the set and patiently asks her to re-do it, several times. Truffault the director of Day for Night, as well as of Pamela is the clever bit that others who tried films-within-films didn’t try. At this point – where we wish she’d just get it right because it’s like a soap being rehearsed; we are also quite enjoying how it allows Truffaut to show how film is created, and the the familiar jokes about film-making – we are not so aware it’s being directed and filmed with Truffaut behind his own camera, because he’s seen so much in front of it. That’s quite clever too. I kept on thinking (for some reason) why not use, instead of a simple film like Pamela, some kind of modern take on Renoir’s Regle de Jeu with those clever mirror shots and complex story. But then the joins would have been easier to see: it would really seem as if it was two films spliced together (which is was anyway), even with Truffaut bridging the two as himself and the framed film’s directer. One is left with so much of Day for Night being a film one would never watch! 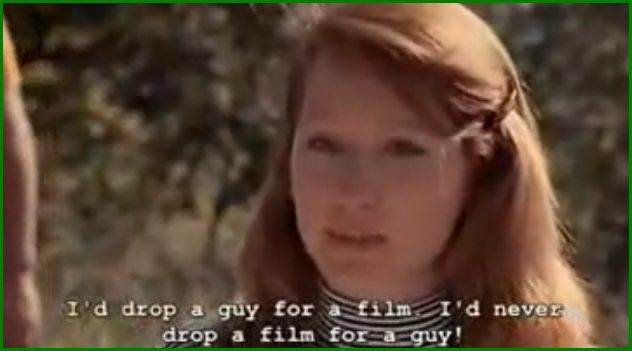 In order to watch his entertaining take on films on films, we have to endure shots re-shot in a film, Pamela, we wouldn’t watch. Of course one of the film-maker’s jokes – made within Pamela at various points, such as the death of the lead actor and the finances, the goings on among the crew – is all this effort is going into the making of film that will probably never get distribution. But his own film, Day for Night, will! Saying that doesn’t say the producer, director and crew as depicted by the actors in Pamela aren’t thoroughly professional. We see the professionals at work in Pamela, but not those creating Day for Night. Illusion 24 frames per second: François Truffaut’s La Nuit Américaine, Daniel Fairfax, Senses of Cinema. The principal question haunting La Nuit Américaine is, on the other hand, whether films are superior to life. Films are more harmonious than life, Alphonse, there are no bottlenecks in films, no dead-time, films keeps rolling forward, like trains, you understand, like trains in the night. People like you and me, you know, are only happy in our work, our work in the cinema. La nuit Américaine was the point beyond which Truffaut and Godard’s friendship failed. e.g. Truffaut, Godard, Day For Night, and a link. The link is to an short edited version translated into English of an interview Godard gave to Christian Jurgen in German NZZ Online [7 November 2010]. (If read in Chrome, a rough automatic translation of the whole interview is possible). The Truffaut-Godard spat is a great story and – is there a film already? – is briefly mentioned in that interview, which also covers Godard himself, cahiers, his explaining his turn away from auteur theory (he says it applied to the New Wave, which passed) his new film Socialsme, and so on. You fell out later with François Truffaut. What was the reason? I noticed over time that he made exactly the films we attacked: Written movies! 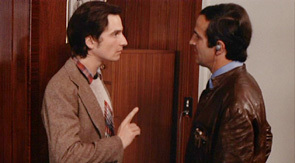 Truffaut’s works were not influenced by the camera, but from the pen. The camera imitating what his pen had written. Godard’s notion of this in some way breaking their rules – as perceived by Godard – of how they made films, links up with my deliberately laboured attempts, below, to look at the joins in Day and Night. I’ve always been a lot more interested in film as a technical medium, its capabilities and limits, than in stories film tells per se, though there are many fine ones, well told. The cleverest bit in a way is not the film-within-film antiques but that Truffaut is the director of Day for Night and his film-within-a-film (Godard in Le Mempris has Fritz Lang playing himself spouting Godard! ), Meet Pamela. It’s the sort of thing that auterists would see in some sort of diagram as the script was developed. The first time we see Truffaut in his trade-mare leather blouson, he being filmed from a crane (yet to be shown itself to establish visually the film-within-film, though we already know this from the behaviour of the actors and the evidence of the camera track running the length of the square) in a medium-long shot giving post-shot instructions to Alphonse and Alexandre. Since he is the director of Day for Night as well as of Pamela, which director is he being at that point? Well, of course, he can relax into this and be both at the same time. At this point, the viewer can see the possibilities and look forward to enjoying the fun. However – sacred bleu, mais non! Incroyable!- I didn’t find it as exhilarating as I thought I might, wondering all the time whether anyone else had tried, or has tried since, a similar take on film-making. Having watched Day for Night and then read up again on what others think of it, I’ve come across all sorts of ideas: that the bus which careers round the square in the main shot is going too slow. Crikey, it looked to me it was a wonder a the speed it was going in such a confined space, circling the square, that no one was hit! That’s where the cleverness of the film is slowly established. Other shots (the film of the film shots) show how the extras are carefully walking, well away from the bus, though in Pamela’s shooting shot, it all looks a bit hairy because the tracking shot is sow low.